Oak Park's catcher David Theis heaped praise on his pitcher Jason Klonoski in this June 1985 state quarterfinal game, according to The Chicago Tribune. After Klonoski threw a one-hitter, it was hard not to, according to The Tribune. "Jason hit all the spots," Theis told The Tribune. "He got the ball where he wanted it; his velocity was up there. The only thing was they got the hit on that ball that had eyes. That ball wasn't hit hard at all." Klonoski went on to gain enough praise to head to college and the pros. His pro career lasted four seasons. He briefly made AAA, but he never made the majors. Klonoski's pro career began in 1990 at independent Bend, signed as an undrafted free agent out of the University of Arizona. He originally signed with the Giants, but they released him before he got into a game. As a pro, Klonoski started at short-season Bend. He got into 26 games, starting one. He went 7-4, with a 2.81 ERA. He went three innings without giving up a hit in relief in a June win, according to The Bend Bulletin. He also struck out five. He originally signed with the Giants, but they released him before he got into a game. He picked up that win against the Everett Giants. "It was definitely on my mind ... oh yeah," Klonoski told The Bulletin afterward. "Being the Giants ... made this one really sweet." Klonoski's performance earned him a slot with the Twins for 1991. 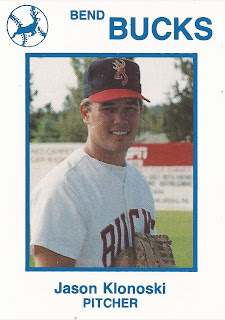 He played between single-A Kenosha and high-A Visalia. He got into 51 relief appearances overall, with a 2.69 ERA. Klonoski then moved to AA Orlando for 1992. He also saw a game at AAA Portland. He gave up two unearned runs in an inning of work there. At Orlando, Klonoski worked a scoreless outing in May, part of a stretch where he gave up a single earned run over 20 innings of work, according to The Orlando Sentinel. Klonoski then played 1993 with AA Nashville. He got into 56 games there, with a 3.16 ERA. He picked up his third save in a June game. That season, though, turned out to be his final as a pro. Chicago Tribune, June 7, 1985: Oak Park 1-hitter 'disappointing'?